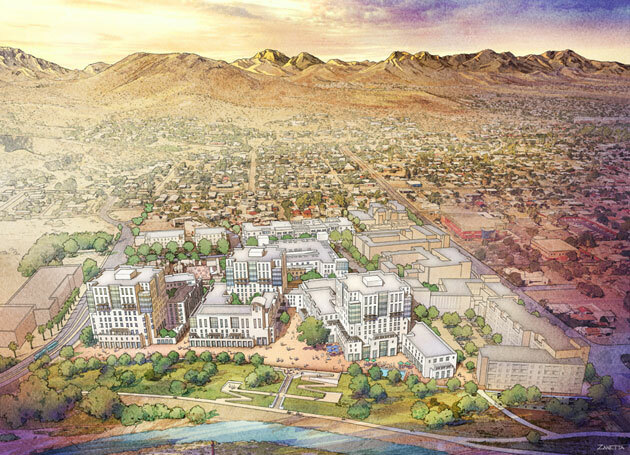 The Bautista is a mid-rise multi-family, mixed-use project in the new neighborhood of Rio Nuevo in Tucson, Arizona, located along a streetcar line connecting it to downtown Tucson. Its program includes 20,000 square feet of retail space and 294 residential units. It is designed as an ensemble of two buildings framing a central linear plaza, lined with shops and restaurants, that connects one of Rio Nuevo’s streets to the adjacent river. Each of the two buildings is organized around two courtyards defined by three-, four- and five-story double- and single-loaded wings. Each courtyard has a cooling tower that revives the classic tradition of passive cooling in the deserts of the American southwest. The two buildings are joined by a third-story community room forming a gateway into the central plaza. The space along the river is designed as a grand promenade with retail and commercial uses as well as various park amenities for the residents.